You know the horrible feeling that builds in your gut when you are explaining something enthusiastically and your audience just looks at you like you have fifty flies sitting on your face? Do they not understand how awesome your my stories are? How fabulous you I am? Usually, I recognize blank stares and contorted noses pretty quickly, so I change my tempo and re-imagine my spiel until I get a head nod. Or a smirk. Unfortunately, I’m less great when it comes to picking up on other’s emotions (mostly because I am too wrapped up in my own selfish world of feelings, or I just don’t understand how karaoke is embarrassing) and so these rose-colored glasses (above) would really be perfect for me – and apparently up my chances of survival. 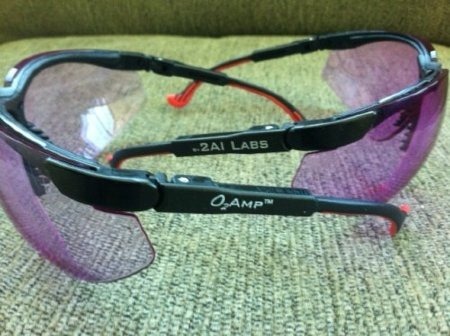 Changizi says these glasses can better help us size up someone, say, a potential mate? But more than reading social cues, I like the idea of nurses wearing these goggles to better see blue veins. All the better to not stick you a million and one times, my dear!